Doctor Who - Revisiting GENESIS OF THE DALEKS | Warped Factor - Words in the Key of Geek. As we continue our Tom Baker theme running throughout the month of January, Tom Pheby goes back to Skaro to revisit the Genesis Of The Daleks. By his own admission Terry Nation was heavily influenced by the impact of war as a child, this certainly reflects in his work, especially in his unforgettable creations 'the Daleks'. 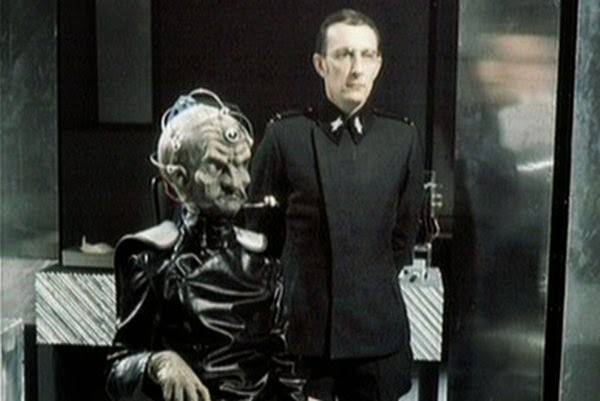 There are undeniable parallels between Hitler's Nazis and the callous metal monsters from Skaro, and they are never more blatantly obvious than in 'Genesis of the Daleks ' - even down to the salutes, uniforms and Nyder's Iron Cross. 'Genesis' has now been issued with a circular red sticker boldly announcing that it has been voted 'The No. 1 Doctor Who story'. Is this just a sinister marketing ploy aimed at clearing DVD shelves at the local HMV? Read on and we will attempt to find out. We open with a shoot out and slomo casualties, setting the scene for what is to become synonymous with the darker Hinchcliffe and Holmes era. The Doctor and his companions Sarah Jane Smith (Elisabeth Sladen) and Doctor Harry Sullivan (Ian Marter) are intercepted (more like hijacked) from their time traveling activities and transported to the barren and bleak planet of Skaro, courtesy of a Time lord dressed in black and resembling a medieval court jester. The tetchy Doctor objects to this flagrant act and whines about interference, but he soon changes his mind when The Daleks are mentioned - "Daleks? Tell me more". The Doctor is asked to avert their creation, or affect their development to render them less aggressive, predictably he accepts. It's not long before the Doctor and Harry are taken prisoner by the Kaleds in a skirmish with the Thals, and we really start to see that war influence of Nation's creep into the script. There's a grim scene where dead bodies are propped up in trenches (this actually happened in WW1), then in all the hubbub and confusion from a gas attack, Sarah Jane is buried under a corpse only to wake up and find she's alone. It's a smart plot device that allows introductions to both parties and perspectives involved in the tragic fight for survival and gives the companions more opportunity to involve themselves in the plot. DOCTOR: Or coffee. My friend and I have had a very trying experience. Haven't we had a trying experience, Harry? TANE: Step into the security scan. TANE: Let me point out to you that you have no rights whatsoever. I have full authority to torture and kill any prisoner who does not comply absolutely with my orders. That is your first and last warning. The Doctor and Harry manage to escape into the wastelands which are inhabited by some scrappily dressed mutants (there doesn't seem to be much wrong with them if I'm honest), it's also the home to a series of botched experiments by the Mekon headed Davros. Meanwhile Sarah Jane is enslaved by the Thals and instructed to load a rocket with canisters of nuclear waste. Often, in this era of Doctor Who, the female assistant would be under utilised, seemingly just there for the Doctor's amusement and to provide a bit of lusty glamour in a sweater, but by separating Sarah Jane it allows Elisabeth Sladen to give one of her finest performances in the character. As long as we overlook the limpest cliffhanger in Who history that is - Sarah Jane falls whilst attempting to climb out of the rocket silo. If she had died at that point it would have been from over dramatic toxemia, normally something associated with Soap actors. Now, some may claim the adulation afforded to this story is unmerited, that it's over-hyped and lacks extensive explanations in part, but essentially it had all the elements of what Who fans want and have come to expect from the seventies shows. High drama, intelligent story telling, superbly executed with wit in abundance, plus it also questions beliefs and morality - especially when the Doctor is given an opportunity to rid the universe of his enemy once and for all. Hell, if he'd got rid of the Daleks, the Doctor could have taken more time out to apply suntan lotion and sport a pair of flip flops on a beach in Torremolinos - just think how much easier his life would've been! There really is a lot to admire about this production, apart from the obvious contributions of Hinchcliffe (Producer) and Holmes (Script Editor), we also have to acknowledge David Malloney's slick direction and the gritty lighting of Duncan Brown, framing the production in grey and green added a great amount of depth that created the perfect post apocalyptic environment. Then there's the Davros mask created by John Friedlander (possibly modeled on Ann Widdecombe?) and the make up of the ever dependable Sylvia James. 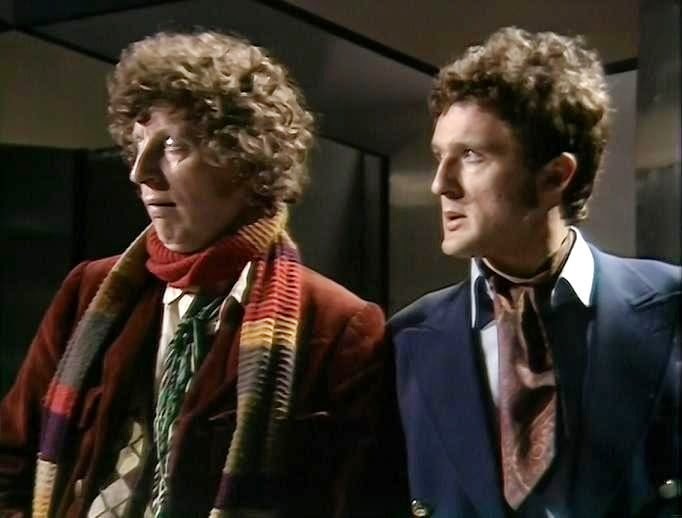 Tom Baker, still relatively new in the role of Fourth, does well to hold his own with Michael Wisher's astonishing portrayal of Davros, and the key scenes that involve the pair are incredibly memorable. Wisher's vocal delivery is the antidote to the excitable and manic Roy Skelton (Dalek voice), who even when interviewed sounds like a psychotic and outraged Zippy (Rainbow - yes he did that too). Peter Miles as Nyder is sublime with his dry, cold and deadly delivery. If there's one weak link then for me it's Guy Sinner who is horribly miscast as Ravon. He looks about as threatening as a Saturday girl working on the checkouts at Sainsburys, and his lines seem to be delivered as if there's a man at the back of the studio with a faulty hearing aide. It's not helped that it's now almost impossible to see him in any other role than that of Lieutenant Gruber from 'Allo 'Allo. My opinion of Genesis Of The Daleks is that it was streets ahead of anything that had been seen previously, that the perfect script arrived for the perfect Doctor at the perfect time in the show's history. Yes we can be critical of some of the sets, some of the casting and some blips in the story but it tends to rise above it with ease. Even put up against today's lavish productions it holds up extremely well. Genesis is a spectacular piece of television that helped shape the future of the series, and confirmed Baker's status as the show's icon so it's hard to argue against that red sticker in HMV. 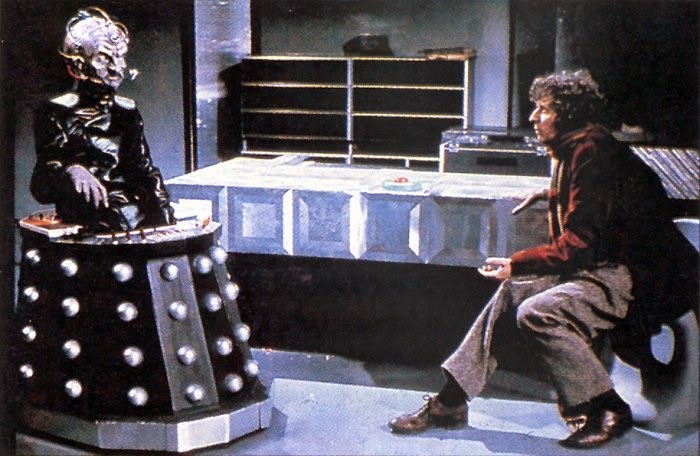 The pole position will forever continue to divide opinion with fans of the show, but I think all would agree that Genesis Of The Daleks is an incredibly important landmark in the evolution of the series, and if it's not 'The No. 1 Doctor Who story' it should at least be in most peoples classic top three.